The IBM Storage Symposium took place in Las Vegas during the last full week of July. Adam went with a coworker and I figured I’d tag along. I used frequent-flyer miles so the trip was extremely cheap. I played poker, checked out the different restaurants and casinos while Adam was at the conference. I pretty much stayed in the Ceasar’s/Bellagio area. There was more than enough restaurants to keep me busy. As for Poker, the plan was to buy in for $100-200 or less. ($3-$6 to $5-$10 limit hold-em) While I was checking out the tables, I saw a $5-$10 No-Limit table with a $400-$1000 buy-in! No-limit pretty much makes the $5-$10 aspect irrelevant. Everyone was sitting with an average of $800 in front of him/her. The reason this caught my eye is because there were a few, forgive me for profiling, older asian ladies at the table just “gambling”. Basically they would stay in every hand, hope they got something, and just end up throwing a lot of money away. I only had $200 bucks in my pocket, and was already $500 down. What the hell! I went to the ATM and took out another $500 and sat down with $800. I got cards and thought I played well. I stood up after a few hours and left with around $2500! No-Limit is quite a rush, which I don’t think goes well with money. I don’t know if I’d do that again, but it was an experience! We went to go see the Penn and Teller show, and I got to meet Penn after the show. I am such a fan-boy. I listen to his radio show, watch his TV show BS on Showtime, and now I’ve seen his Vegas act. I’ve seen all the bits from various TV shows, but it was still great. My favorite is the Silhouette rose bit, which is one of Teller’s oldest tricks, according to the Bravo Profile, which I’ve also seen! I got an autograph and got him to do the double-pistol pose with me. It is so cheesy it’s funny! I got Alton Brown to do it a couple years ago as well, hehe. Near the end of the week, Adam’s brother Trevor, sister-in-law Laura, and friend Dawn, came into town to celebrate Adam’s birthday on Sunday. One of Trevor’s friends Marcus is one of the Blue Men, and was able to hook us up with tickets to the show. This is me posing with him afterwards. He wouldn’t do my double-pistol, although he did do a funny post for it. 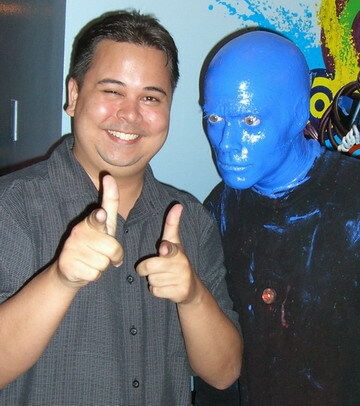 He explained later that they have a list of policies that they have to follow when in that Blue Man persona, so that’s what he had to do. We hit a bunch of clubs and bars and just had a great time. I took a “red-eye” flight on Monday night after eating at the Emeril restaurant in MGM with Laura. I think I sat next to Doyle Brunson when I was there, but I wasn’t 100% sure, so I didn’t bother him. He was sitting with 2 other guys with strong TX accents and cowboy hats, talking about poker. If it wasn’t him, it was still cool as hell!